Check your blender instructions: some advise against using hot liquids. The base-seal could leak fluid onto the electrics, or the glass could crack. Damn…. This is good! I put in some brown sugar and baking cocoa.. delish! Should this be had alone on an empty stomach or can you have food along with this coffee blend? Thanks! Old thread, but I experience this too. A sort of scratchy, itchy, stuck in the back of my throat kind of feeling. It’s only if I froth the oil in my coffee. If i drink it just floating at the top of the coffee, I don’t get the feeling. Still haven’t found an answer for it yet. I froth my coffee with the coconut oil and it’s so yummy, i have fatty liver decease and was told to drink black good coffee because good coffee actually heals the damaged liver cells. Thank you for the coffee recipe. Recent research has shown that by emulsifying fats their absorption is improved. Hence the need for a blender or stick blender. Thank you for that info. I did the same just adding it to my cup of coffee. I actually had decided to start taking coconut oil last night (my husband has been taking it for a while now). I tried just eating some (yuk) but then I thought I’d add some to my coffee. (Better) I’m new to coconut oil but I’m reading a lot about its benefits. Online or on Sky chl 670.
this takes away stomach woes in the early morning. Now you can use coffee and coconut oil for your weight loss as it consider one of keto diet. Combination of coffee and coconut oil reduce post workout soreness but in case of nausea consult your doctor first then consume it. Mmm yes! It’s also very filling too. I’ve been finding a few recipes online using Coconut oil and it’s all very yummy! Thanks for sharing this Tiffany. Just wondering why gelatin in the coconut coffee. What are the benefits of the Gelatin. My boss mentioned this to me this morning..so I have decided this is how I will drink my coffee , being that I love coconut…and am looking forward to seeing the results…Thank You!! Is this a hot or cold coffee recipe? Also, why the gelatin – can i do without? You can make this with hot or cold coffee. For cold coffee, melt the coconut oil before adding it to your coffee mixture. The gelatin is optional. Click on the gelatin link to read about the benefits of gelatin. Love coconut oil for everything ???????? Something to keep in mind w/ the coconut oil coffee, you cannot pour your coffee into a styrofoam cup, or even a “hot/cold” cup w/ a plastic/polystyrene/plastic top, like you find @ all the major retailers & especially wholesale clubs like BJ’s & Costco. The Dixie hot/cold cups w/ the white tops are especially susceptible…the dark ones not so much. The coconut oil will dissolve any of these plastic containers. Verified well-known science, feel free to research. Virgin unrefined organic coconut oil is especially brutal on these plastic containers. Even raised the alarm to the Dixie/Georgia Pacific folks before I knew it was established fact & they asked me to send in a sample! No thanks, no cataloging of my DNA, thank you very much. I really like your ideas and recipes. The sunscreen is great for my waterbaby. Hi, I’ve been an advocate on the benefits of coconut oil, is there a brand you recommend? I also have gotten into biohacking, do you recommend Dave asprey’s brand as far as coffee, octane and unsalted butter? Hi Tiffany. Right now I use Half and half in my coffee. I am interested in using coconut oil for its healthy benefits. I’m wondering if I could just add coconut oil to my coffee and not the half and half. Or, should I add both? I have a hand blender but I’m afraid I would spray hot coffee all over the place. Yikes. Does it still work the same in decaffeinated coffee? The coffee recipe is good! Hi Tiffany. I did drink my coffee with coconut oil for about 2-3 weeks but I had to give it up. My through feels very irritated when I had my coffee with the coconut oil. Wondering if anyone else sad same issues ? Yes! This happens to me too and I was wondering if I was the only one. My throat feels sort of dry and scratchy when I add coconut oil to my coffee or tea. Which is the opposite of what you would expect. Does anyone know why this happens? Do you have a favorite brand of rapadura ? I can’t find it at Trader Joe’s. Can’t wait to try the pie crust. Thanks for your hard work. Are there any limits on if you can eat with this, or how long after you can eat, etc? I have added jaggery for the sweetness. Is this OK? And what will be the benefits to add jaggery to this coffee. Can I use liquid coconut oil in my coffee? It was DELICIOUS! I was scared, but wow. Sold. Thanks. It is rally very superb use of COCONUT OIL for preparing coffee. I think it is also tasty and good for health. I appreciate to this post which represents vast methods.Thanks. Add Cardamom to this recipe you will be blown away! I drink five cups of coffee a day and I just started using coconut oil in some of them — I love it. I’m glad I ran across your idea. first I have heard of fixing coffee using this recipe. I am definitely going to give it a try! Sound delicious! I have never digested coconut oil before but I am trying the new ketogenic diet and it suggests using coconut oil and also adding it to your coffee with butter. The recipe for the coconut oil/butter coffee sound delicious. I’ve never made it before and the recipe doesn’t make it very clear…it just says to put the ingredients in a blender…blend & enjoy. I am thinking they meant using fresh, hot black coffee to create this beverage. Is my thinking correct? Hi, I’m new with adding coconut oil to my diet.Do you use the organic refined or unrefined in your coffee?The coconut flavor is realy strong to me, but I do want the most benefit it offers. Oh my gosh! I used to drink coffee with butter and or coconut mixed in with a spoon and some sucanat but blending coffee with coconut oil, gelatin, a smidge of cocoa powder and sucanat. Whoa!! Creamy goodness. Even my man loved it. He said he’d drink it every day and he’s usually a coffee once in a while guy. I love coffee and coconut, I read all the great things about coconut oil, and going on and on telling my husband. So surprise I just received my first very large jar of coconut oil ( he loves me).? I love coffee and coconut, I read all the great things about coconut oil, and going on and on telling my husband he also knows my health is not good and getting worse. I have ARDS which gets me exhausted very quickly which kicks up my anxiety so I’m always on timeout ( says my daughter)! So surprise I just received my first very large jar of coconut oil ( he loves me). So your coffee recipe caught my eye and I’ll get back to you in a couple of months weeks , soon.? Thanks for pointing that out. I just fixed it. Can I simply add the coconut oil to hot coffee? Will it mix OK by stirring? Late reply, but, yes, I add coconut oil (plus, in my case, a pat of Irish butter and a pinch of sea salt) to my hot cup of coffee and stir. It works fine. Just stirring it in really doesn’t give the same result. The nutritional profile is the same of course, but blending the coconut oil and coffee emulsified the oils and makes it creamy. I’ve loved coconut oil from long ago. My dilemma is that I can’t take it because of the smell. I gag, occasionally vomit. I think I overdosed when I first found out about it. I really want to get back to consuming it. Do you have any ways to overcome the gag? I even try holding my nose! Lol! Linda, have you tried refined coconut oil? it’s deodorized and doesn’t have the coconut-flavor, but still has MCT’s. I think the anti-oxidant properties are decreased, though. I love this! Just tried it with fresh brewed organic coffee, coconut oil, gelatin, cinnamon in the blender! I did not add sweetener and it passed the sweet tooth husband test! He loved it too! Thank you for your lovely site! I just made this and it is wonderful. I did not add cream because I wanted to save the warmth. I did not add sweetener because I wanted to see if it would pass my husbands sweet tooth test! He loves it! I added cinnamon, gelatin, and coconut oil to the organic coffee in the blender! Thank you for this healthy treat idea! What if I just add coconut oil to coffee with cream and stevia without the blender and gelatin? Would it be just as healthy? Can you get the same effect by putting the coconut oil in your regular coffee , no honey, sugar…etc, just black coffee with the oil and a bit of creamer?? Just curious- why the blender? I am not a coffee drinker but i drink alot of green tea, would this work in tea also? Love all the great info on coconut oil, am definitely going to try it with coffee in the morning. I add organic coconut milk to my coffee every morning, would this have similar benefits? Just found your site by Googling “coconut oil in coffee”. I’m sitting here with a coconut/almond milk latte with coconut oil for the first time ever. It’s seriously delicious! I’m on a very strict errrr…..overwhelming Candida diet and coconut is a fantastic natural antifungal as well. 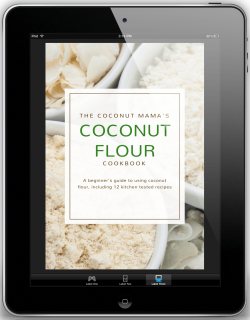 Can’t wait to check out more of your site for ways to use coconut. Thanks so much for your help! I read the article where you put gelatin in coffee. What is the benefit of doing that? Hi Tifany, thank you very much for educating us. Does the coconut oil help Diabetic patients in any way? Thank you. We use an immersion blender to do this. Less mess, fewer containers and clean up and perfect coffee! I was wondering if these benefits work for men as well… Thanks. what about high cholesterol? I love coconut oil in my eggs, my coffee and I cook with the refined for meats so theirs no flavor. I consume a lot. Should I be worried about high cholesterol? I told my friend about the coffee and she brought up the cholesterol concern. Thought I’d check. Hi Tiffiany. I ran across your very informative blog when I googled “can I add coconut oil to coffee.” I just recently discovered the many health benefits to coconut oil after watching the show “Know the Cause.” Have you ever watched it? Thanks fo posting. God bless. Hey! I was wondering what else do you have along the coffee in the morning? Or is it the only thing you have for breakfast? Love your site and all your Facebook posts. Gotta edit a bit for credibility, though. -30 millimeters of coconut oil is tricky. New to coconut oil. Love reading about it. Need info on it. I have a question, please? I found Carrington Farms liquid coconut oil on my local store. Is this the same thing as fractionated CO? Could I use it as a carrier for EO’s? does butter give you the same benefit as coconut oil? I use butter in my coffee! It’s delicious! going to try the coconut oil . can’t wait for more info. Would it have the same benefits for men? Just change 30 millimeters (measurement of length – a little more than an inch) to 30 milliliters or mL (measurement of volume – should be about what’s on that teaspoon), and I will try it. Added honey to the coconut oil and coffee, really enjoyed it. When you shake hot coffee and coconut oil together, do it over the sink as it flows out. I’ve tried it with organic, grass fed unsalted butter along with coconut oil. Really good. I swear, I wasn’t hungry for hours. Can u tell me the brand of coconut oil which can be easily available in India? Where do you buy the Gelatin Collagen Hydrosylate if you’re in Western Canada? I buy mine from health food store here in M.B. The Trim Healthy Mama brand. Great idea’s! So, does the coconut oil clog your drain? I use coconut oil in my hot tea every day. I haven’t lost weight…any suggestions? I also put a few tbsp. on my dog’s food twice a day. It has helped with her allergies. She had a hotspot on her back the other day and I rubbed some coconut oil on it and within a few hours it wasn’t red and itchy anymore. The next day it was gone!! Hello again. Allow me to express my excitement and satisfaction of my first experiment with coffee with coconut oil. As an old fashionable European I drink only double ristretto, double espresso and occasionally double macchiato. And I was very impressed of my two doses of double espresso this morning poured over tea spoon of coconut oil. Both done with different labels Extra Virgin Coconut Oil to see the difference. Thanks to you Tiffany, I found another way to increase my daily intake of coconut oil. And also thank you very much for the above links to gelatine resources. It is a long time now I was thinking to include it in my daily intake too, and you remind me of this “procrastination”. Thanks for all tips and sharing your knowledge and skills. i also add my protein powder to this in the am. It makes as a delicious shake and doesn’t spike insulin like fruit would and doesn’t require sugar. Keeps me full and taste like dessert. Hi Tanya! Gelatin has a lot of benefits. It’s great for bone and joint health, helps heal the the gut, strengthens hair and nails and is a good source of anti-inflammatory protein. Tiffany, you have done it again :). I have been looking for ways to get more gelatin. Tried your coffee recipe this morning and added the gelatin along with the coconut oil. Yummy!! Love your website! It has helped me tremendously! I have been adding coconut oil and gelatin to my coffee for a while but I just measure out both, put them in the bottom of my mug and then pour the hot coffee on top. The froth is nice, I’m sure, but I just keep my spoon in my cup and stir it a few times while drinking. I also do this with hot tea at least one more time throughout the day, if not two more times. When I make my cup of coffee I just stir in coconut oil before drinking.. I don’t blend mine.. Should still get the same benefits right?? Hi Tracy! Yes, you’ll get the same benefits. Thanks Tiffany … love your info and I am definitely going to try your coffee! Where you list coffee in your ingredients list, do you just mean coffee powder? which one of 3 gelatin you use from Great Lakes? Beef gelatin? Why do you add gelatin? Thanks! Sounds great. How much coconut oil do you put into the blender? Hey Tiffany! 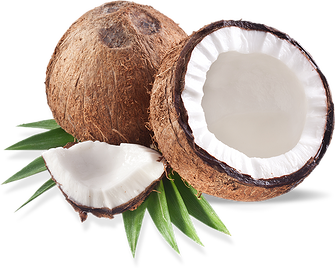 I am also passionate about coconut and love getting your emails on interesting ways to incorporate more coconut into my diet and beauty regime. Question: I like my coffee with milk and coconut sugar. Do you think the milk will diminish any of the coconut oil properties or the way my body absorbs them? I noticed you don’t use milk in your recipe or put it in the list of optional add-ins. Any reason other than a preference for black coffee? Ooooh! Coconut milk in my coffee sounds amazing! I will definitely try that one bc I never thought of it! Right now, I’m sipping my coconut coffee and it’s deeelicious! I don’t have a hand blender so I just put it in the regular blender on high for 10 seconds. It came out super frothy and tastes even better than it looks! Thanks again! can you just put the coconut oil in your coffee? I don’t have a blender. I used to blend and now I just spoon in to save time. The oil rises so it takes awhile to get used to it but my lips are actually softer from the exposure! Also I do use coconut milk and it is awesome! I use grated orange rind along with the coconut oil in my coffee, gives it a fantastic flavour. No it’s not the same as blending. If you just add it it just floats on top like an oil spill. Blending it makes it creamy and adds a nice froth on top. Tastes completely different. i just mix it in like Sugar and tastes wonderful to me..do it as you like! Don’t dump the left over coconut oil after cooking etc, feed it to your pets. That’s a great idea! I don’t have pets, but it’s a good tip for those who do! I have 2 little Shi Tzus and they get a teaspoon of coconut oil every day. They love it!! Thanks a heap for your book being available. Your site is simply superb – not over the top and waffling in detail – just right. Off to try the cofee and coconut oil right now. Hi Tiffany, I love your entire site. You get to the point, the recipes are easy and your information is always pertinent. Keep up the fantastic work!